The U.S. Census Bureau reports that the annual U.S. trade deficit in goods and services increased slightly from $500.4 billion in 2015 to $502.3 billion in 2016, an increase of $1.9 billion (0.4 percent). This reflects a $14.4 billion (5.5 percent) decline in the services trade surplus and a $12.5 billion (1.6 percent) decrease in the goods trade deficit. However, the small increase in the overall goods and services trade deficit, and its downward trend over the past decade, mask important structural shifts in U.S. trade. Falling petroleum prices and rising domestic petroleum production and exports have obscured surging imports of nonpetroleum goods (NPGs) —the vast bulk of which are manufactured products—into the United States since 2013. The trade deficit in NPGs, which has the most impact on workers and communities, has increased sharply. 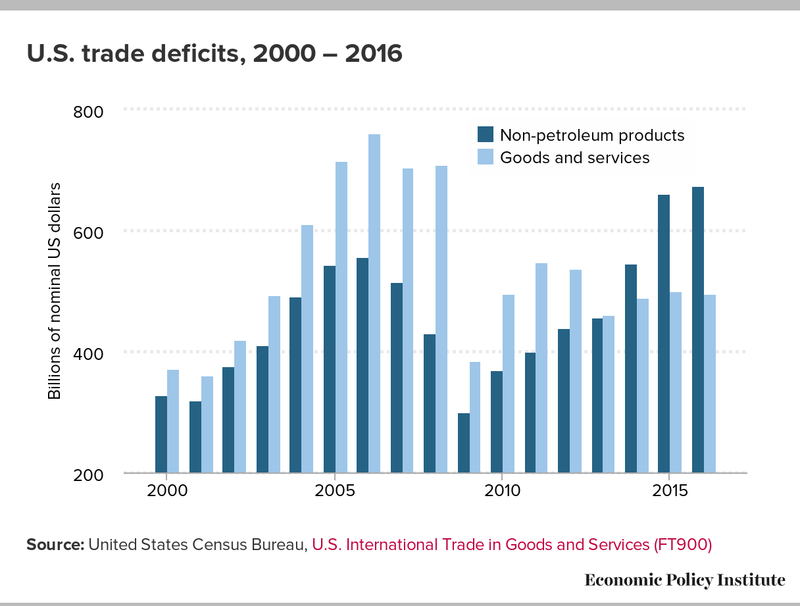 The U.S. trade deficit in petroleum goods declined by $22.7 billion (32.8 percent) in 2016, while the trade deficit in NPGs increased by $16.4 billion (2.5 percent), continuing the sharp run-up in the NPG trade deficit since 2013. The U.S. trade deficit in NPGs is now at an all-time high (shown with dark blue bars in the figure below) while the overall U.S. balance of trade in goods and services (shown with light blue bars) has fallen sharply from a peak of $761.7 billion in 2006 to $502.3 billion in 2016—obscuring the much larger (and more important) trade deficit in NPGs. The fast-rising trade deficit in NPGs has slashed the growth of manufacturing output and employment. The United States lost 46,000 manufacturing jobs in the past year, 1.4 million since the start of the Great Recession in December, 2007, and 5 million since the previous peak in March 2000. Trade in NPGs is highly price competitive and therefore especially sensitive to changes in the value of the U.S. dollar—which has gained 25.4 percent in value since December, 2013. The rising dollar has reduced the cost of U.S. imports and made U.S. exports more expensive, and therefore less competitive, on world markets. As a result, U.S. imports of NPGs have increased sharply in the past three years (rising $143.7 billion or 7.6 percent), while U.S. exports fell $76.1 billion (5.3 percent), and the trade deficit in NPGs has increased by $220.3 billion (48.2 percent). U.S. actually added more than 900,000 manufacturing jobs between the depths of the Great Recession, in February 2010 and January 2016, as a result of investments in the Recovery Act, including the auto bailout. However, manufacturing employment peaked in 2016 and the United States has lost 46,000 jobs in the past year, as noted above. This is a direct result of recent appreciation in the U.S. dollar, and the growth in manufacturing imports, which reduced demand for domestic manufactured goods and have reduced manufacturing output and employment (with a two year lag). Recent increases in the dollar’s value since the election will exert renewed pressure on manufacturing output and employment in the future. Misalignment of the dollar against the currencies of China, Japan, and the EU is responsible for the large, persistent trade deficits with these countries, which was responsible for more than three quarters (76.3 percent) of the total U.S. goods trade deficit in 2016. This currency misalignment reflects a history of large, persistent currency manipulation and price distortions. Meanwhile, persistent, currency manipulation (which continues to this day) by a group of other nations, including Denmark, Hong Kong, Korea, Malaysia, Singapore, Switzerland, and Taiwan also contributes to growing U.S. trade deficits, especially in NPGs. The U.S. Treasury has refused to identify any of these countries as currency manipulators for more than 20 years, despite overwhelming evidence of persistent currency market intervention designed to increase the trade surpluses of these countries, at the expense of the United States and other deficit countries. U.S. policies of malign neglect of the dollar are largely responsible for the growth of NPG and manufacturing trade deficits in the past 20 years, and for the loss of manufacturing jobs in that period. Other forms of unfair trade, including subsides, dumping, maintenance of massive amounts of excess production capacity, and discrimination against U.S. exports have also contributed to growing U.S. trade deficits and job losses over the past 20 years, but currency manipulation and misalignment remains the single most important cause of these growing deficits. The United States should respond by negotiating a realignment of the dollar with China, Japan, and the EU, and by actively intervening to offset currency manipulation by countries such as Denmark, Hong Kong, Korea, Malaysia, Taiwan and others.